Google Photos has disrupted the cloud media backup industry. By offering unlimited storage for photos and videos on your smartphone for free, the app is tempting for any Android (or even iPhone) user. 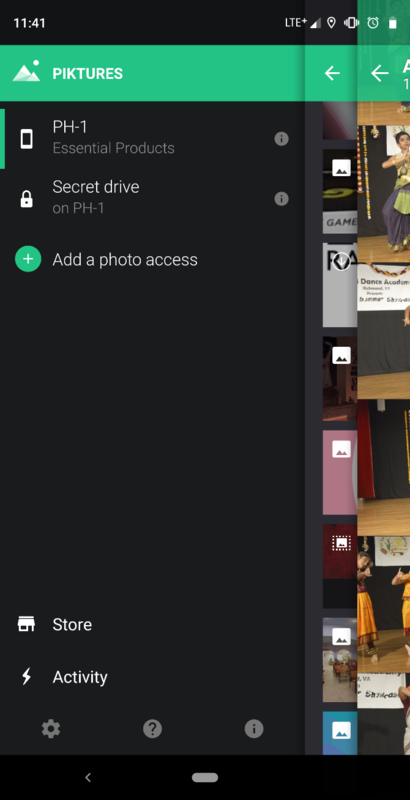 An increasing number of Android phones only have the Photos app, with no other default gallery app pre-installed. But is Google Photos the only image viewer you need on your phone? Probably not. Here are the reasons why you’ll want to install another app, and the best choices. 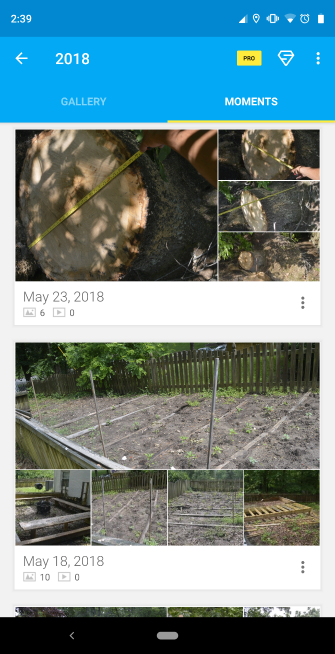 Why Don’t You Love Google Photos? There’s a lot to love about Google Photos. In addition to backing up photos, its search and face recognition is industry-leading, and its assistant intelligently creates albums, animations, and even movies What Can Google Photos Assistant Do for You? 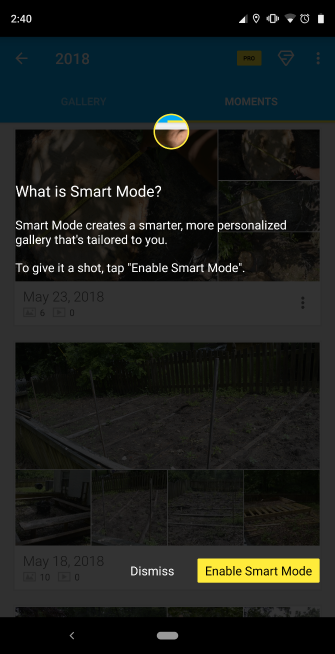 What Can Google Photos Assistant Do for You? Assistant is one of the best features of the Google Photos app, but you could be missing out on its best features. Here's how to take full advantage! Read More of events. Google Photos even has some ingenious features like a click-and-drag gesture to highlight multiple photos swiftly, plus a one-tap button to free up space by deleting media from your phone that’s already backed up. If you have a Google Cast device like a Chromecast, you can easily beam your photos and videos to the big screen. 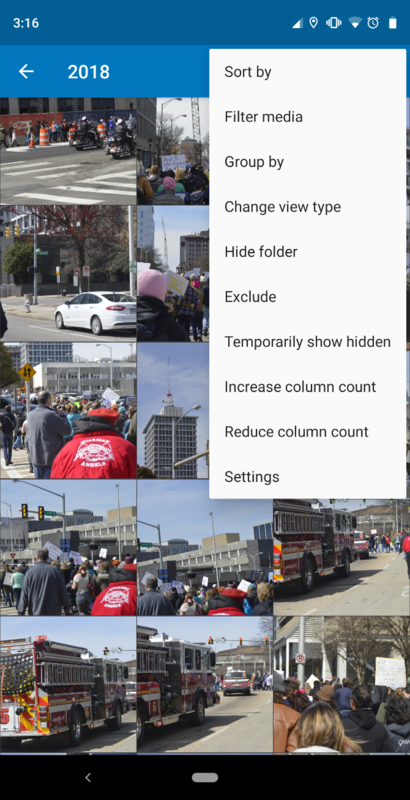 And this is just the tip of the iceberg of everything Google Photos can do 12 Amazing Google Photos Features You Didn't Know About 12 Amazing Google Photos Features You Didn't Know About Google Photos is a well-known service, but it holds many little tricks. Here are 12 great features of Photos you might have missed. Read More . Having said that, there are some interesting Gallery apps available that do much more. Many of them also have that familiar “gallery app” feel, which should make longtime Android users feel right at home. 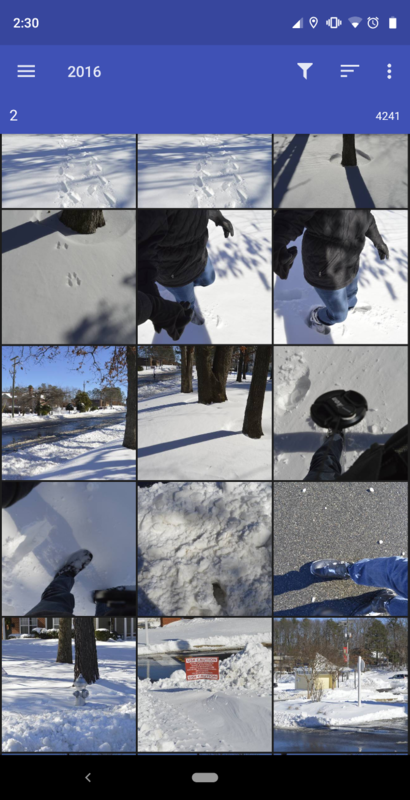 Want a simple, no-nonsense gallery app? Simple Gallery delivers. You can browse the folders on your phone’s internal memory, view images in a grid, and swipe around between photos. If it sounds basic, that’s the point. That’s not to say the app doesn’t come packed with extra features. It lets you change the color of the interface from orange to something more aligned with your taste (I went with blue). There’s also an option to set max screen brightness and auto-rotate images when viewing in full screen. You can also hide the interface entirely whenever you start up the app. If there’s a lot of junk you don’t want cluttering up your gallery, you can exclude entire directories from its system scans or tell the app to hide certain images. You can then password protect those pictures or the entire app. Simple Gallery is free, but there’s a donation app you can buy if you want to show the developer some support. This app made it onto our list of the best Android apps of all time. 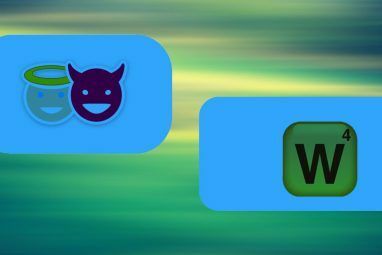 The good news is that all the epic features from QuickPic (a formerly excellent gallery app we no longer recommend you install Do Not Install These 10 Popular Android Apps Do Not Install These 10 Popular Android Apps These Android apps are extremely popular, but they also compromise your security and privacy. If you have them installed, you'll want to uninstall them after reading this. Read More ) are also available in Piktures. Apart from that, this app has a unique design with album cover photos that exhibit a parallax effect. 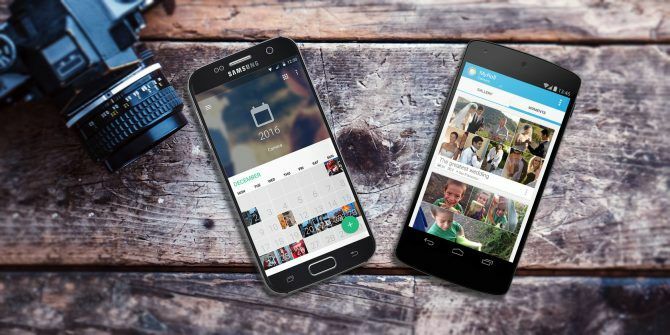 With Piktures, you can filter by photos, videos, GIFs, or even by location. 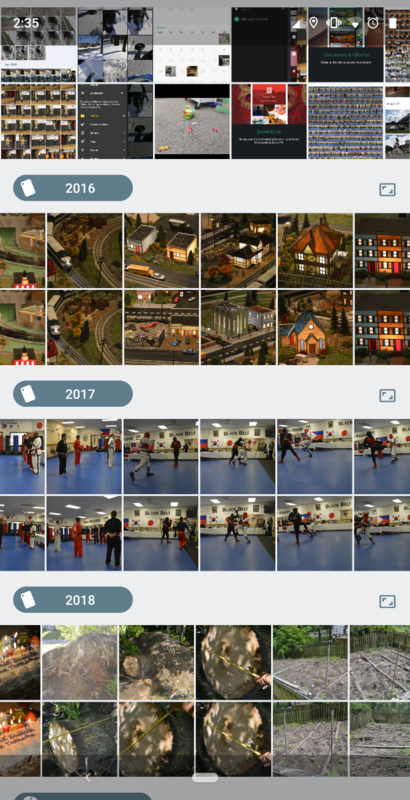 There’s also an interesting calendar view, where it shows a month view with thumbnails and a count of how many photos were taken on a particular day. Piktures also has a QR code scanner built into the app—this should be useful if your default camera app doesn’t have it already. But if that wasn’t enough, there’s also a neat OCR (Optical Character Recognition) How to Extract Text From Images (OCR) How to Extract Text From Images (OCR) The best way to extract text from an image is to use optical character recognition (OCR). We show you seven free OCR tools for the job. Read More feature that converts text within pictures into an editable format. Just tap any image, select the three-dot button in the top-right, and choose > Extract Text (OCR). While all the features mentioned above are free to use, an in-app purchase unlocks features such as accessing cloud drives like Dropbox and OneDrive, and even physical drives via USB OTG. A+ Gallery has a spartan appearance but with one standout feature. 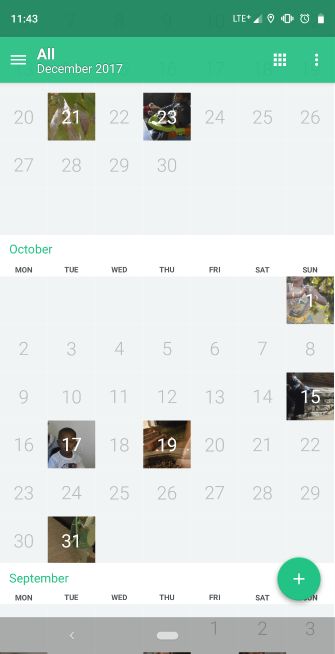 Similar to the Photos app on iOS, it offers a day, month, and year view of all your photos. Also, you can check where your photos were taken on a map, as well as viewing photos from your Facebook, Dropbox, or Amazon Cloud Drive accounts. While the Facebook integration seemed like a cool idea, photos from my personal album didn’t quite load as expected. The app is free to use, but shows ads within the interface. To get rid of the ads, you can upgrade to the premium version for just a dollar. Along with disabling ads, this includes features like a recycle bin and themes. F-Stop Gallery has a similar Places feature that charts the geolocation data from your photos on a map. You can also view the precise coordinates of any photo on Google Maps. There’s a plethora of sorting options in this app—other than sorting by name and date taken, you can also sort by size and even day, week, month, or year. 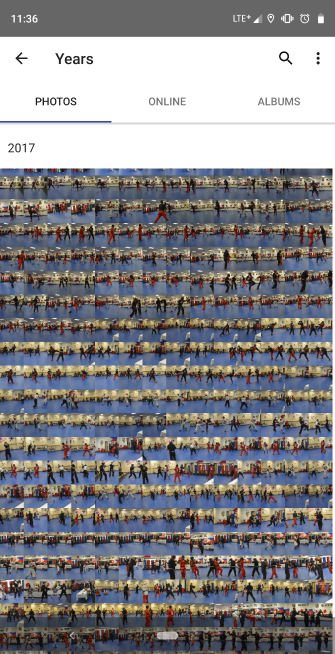 Each image can be rated by a press-and-hold action while viewing it full screen. 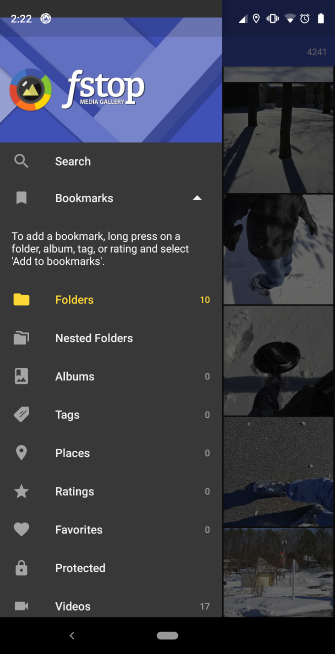 While the app is free to install, an upgrade to the Pro version unlocks features like writing metadata, custom sorting, themes, nested albums, and more. If you’re looking for a Gallery app with a simpler appearance, Focus is as clean as it gets. It includes the ability to tag photos using a couple of preset tag as well as ones you create (custom tags are a Pro feature). This app also supports the smart picture rotation and brightness features we’ve talked about above. Alongside custom tags, the Pro upgrade gets you a dark mode, custom collections, a vault to protect your media, wallpapers, plus more features. There’s also a mode to lock down the screen to a single image within an album, so others can’t swipe to see more than what you want them to see. The most unique aspect of Gallery (formerly MyRoll Gallery) is a feature called “Moments”. It puts pictures from each day in a folder, making it easier to gloss over snaps taken on a specific date. There’s also a handy play button that slideshows photos from a particular “moment.” A Smart Mode creates a personalized album, highlighting the best photos on your phone. 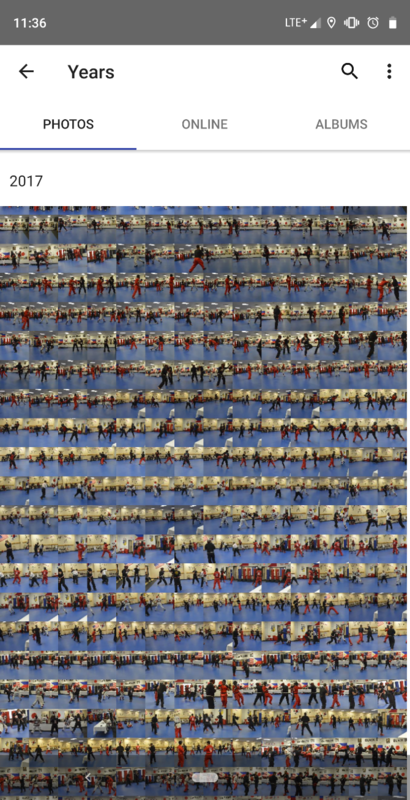 Basically, it identifies images it thinks should go together and groups them. Gallery also supports Android Wear, allowing smartwatch wearers to view and even delete photos directly from their wrist. The app shows ads in the free version; upgrading to the Pro version removes them. Want Something More Like Google Photos? 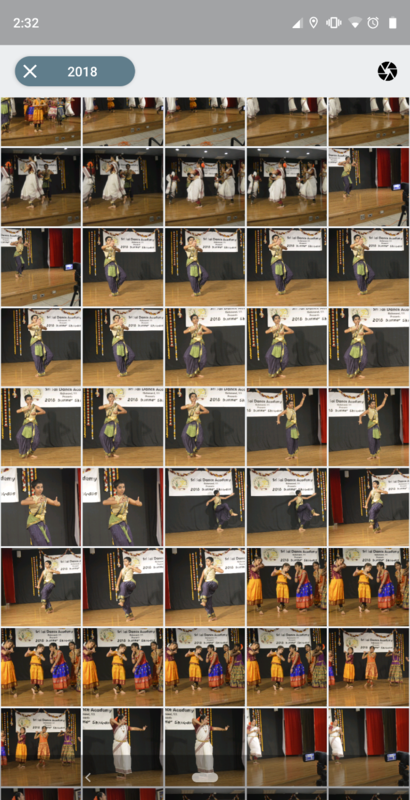 Google Photos is a great app that preserves your precious memories seamlessly in a cost-effective way. But that doesn’t make it only decent online option. If you like the perks of a cloud-based solution, there are several online alternatives to Google Photos 6 Google Photos Alternatives to Use If You're Tired of Its Shortcomings 6 Google Photos Alternatives to Use If You're Tired of Its Shortcomings If you need some Google Photos alternatives, consider these apps and their unique features. Read More . 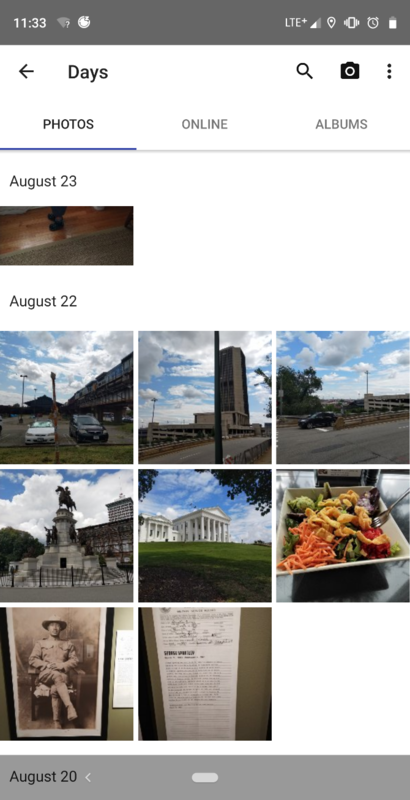 If you’re already an Amazon Prime subscriber, you might want to pit Google Photos and Amazon Photos against each other Amazon Photos vs. Google Photos: Which Is Best? Amazon Photos vs. Google Photos: Which Is Best? Amazon Photos is one of several worthy alternatives to Google Photos, but how do the two compare? Read More and see which one comes out on top. If you’re looking for additional ways to get more out of your photos, check out these Android apps that create fun movies out of your pictures. Explore more about: Android Apps, Google Photos, Photo Album. Do any of these allow one to search by IPTC tags? I have tens thousands of photos in my collection backed up on Google, but I cannot search them easily. One has to try and guess what Google thinks is in the photo, rather than using the keyword tags I used when I originally stored the photo. 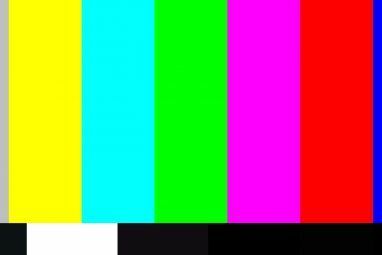 Sometimes I can't even recall what year I took the picture I want. 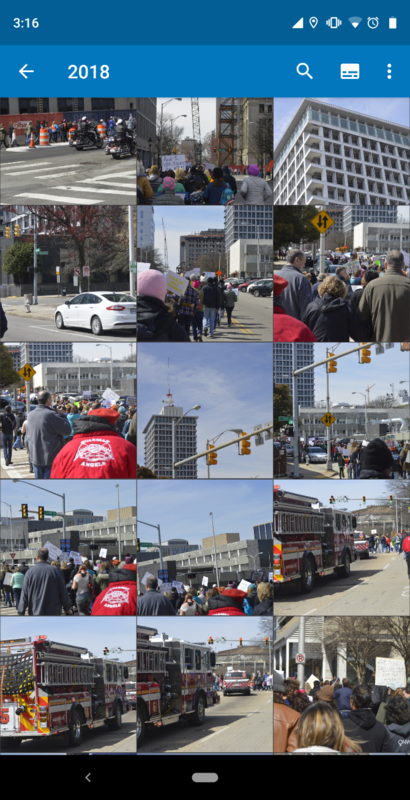 Google's discontinued Picasa is a terrific photo organizer for my needs-- I still use it on the desktop, but Photos is a poor replacement since I can rarely find the shots I want. It's like a colossal shoe box. (Slightly Modified) Version 4.5.2 of QuickPic can be downloaded from here. It is the last version before QuickPic was sold to Cheetah Mobile. 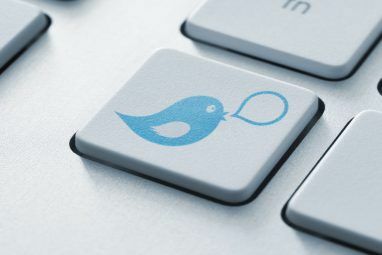 I use this version and it is adequate. Been a long time user of that version, even got a locally patched file that is cut from the play store (to stop it from automatically updating) but with recent versions of android it tends to run unstable. Looking for a replacement I ended up with F-Stop, which is fine, but still not the same. btw, same goes for ES file explorer, they are bloating the quite useful software with all sorts of stuff nowadays. People should be wary of installing QuickPic. Since being acquired by Cheetah Mobile a couple of years ago, there have been concerns about the security of your data.